I'm also testing out an alternate challenge; each door will be in a separate world. This is a very short introduction, but I wanted to get something out there before everyone starts to think that I'm just pretending to do the challenge. Traits; Genius, Party Animal, Neurotic, Flirty, Hydrophobic. 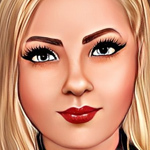 This first introduction is in Alicia's perspective, so you can get to know her a little bit. The rest are going to be in third. I've been called many names in this life, and not all of them can be said in polite conversation. The one that stuck around the longest is Alicia Snowe. Teachers once told me I could be anything, but my parents were quick to say I would amount to nothing. "Go to medical school, get a degree, be a doctor, make us proud!" they urged me. You see, here's the thing. I don't know what I want to do. I could be anything. 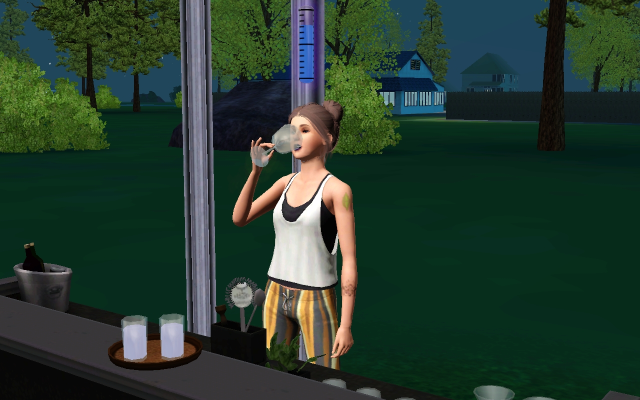 A doctor in Moonlight Falls, treating the sick, and watching the years of my life roll away as many are either saved from losing theirs or going onto the next life. What if I mess up? And a lot of people die because of me? What if I don't wash my hands enough? A mixologist in Bridgeport, party all night, sleep all day, surrounded by the beautiful people, in the city that never really sleeps. What about when I get old? The stars of Bridgeport don't want to party with a sad old dried up old woman who never did anything with her life other than providing them with the drinks that intoxicated them into getting all that bad publicity. 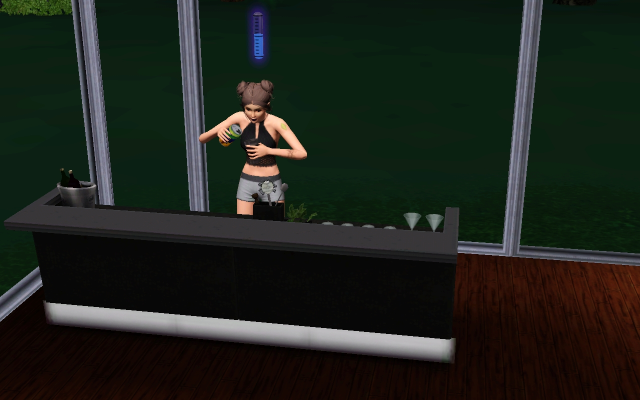 Or I could settle in a place like Sunset Valley, working as a receptionist at the spa for 33 simoleons an hour, barely got enough money to pay the bills, but hey, the party will never stop. Plenty of people will want to party with a girl like me. Right? What if the party stops? What if I end up some boring house wife, with two kids, and a picket fence stressing over diapers and dripping babies, while my husband works all the time? I left the park, hailed down a taxi, thinking hard on my decision. What do I do with the rest of my life? Then the cab driver asked me, "So, lady, where you heading?" Last edited by Nevermore on July 2nd, 2018, 2:41 pm, edited 40 times in total. Last time we checked in with Alicia, she had a decision to make. 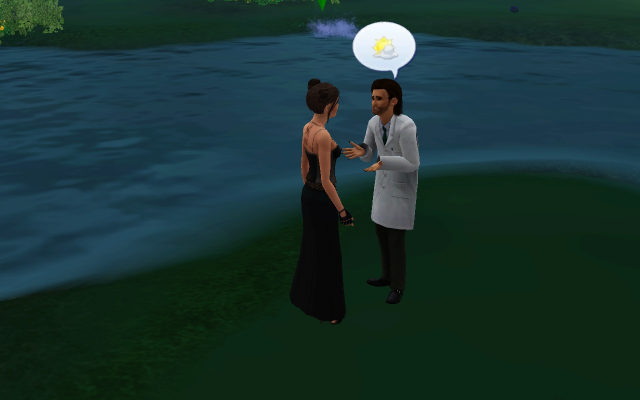 In this particular door, she decided to take her parent's advice, and go to Moonlight Falls and become a doctor. Gorgeous house built by Mpart. 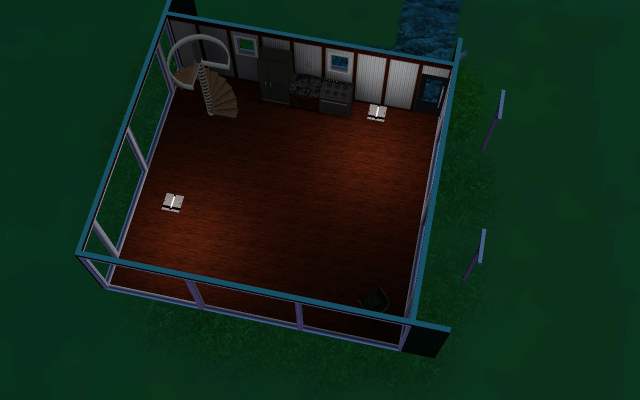 Interior decor will be by me eventually, also a tiny bit of garden there was my touch as well. It's a good thing she came here to be a doctor, since it is right across the street. That will be good after she's partied all night, and won't have far to crawl to work. "There you go, parents, I'm now a doctor." A doctor five seconds, and she rolls a wish to gain a point in mixology. 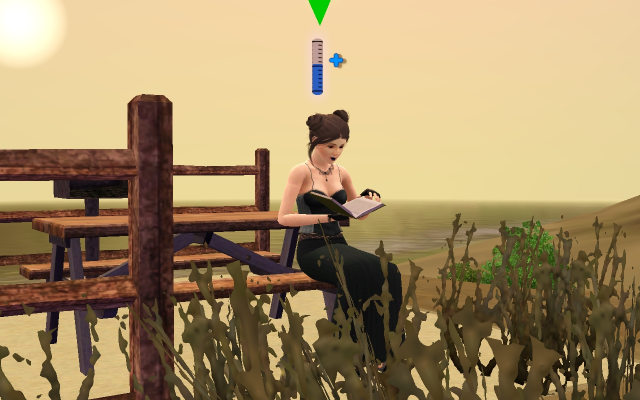 Since classes cost more than she can afford, and there is no bars with proper bartenders in Moonlight Falls, she has to go to the library and read some good free books. For some reason, while reading this book she got a wish to meet a Supernatural. That's funny, because all sims that turned up were human. Good view of her ink! A plumbob on the shoulder, and not that isn't a rash on her forearm. Next stop for Alicia was a vampire bar to fulfil that wish, but it was closed. Instead, she decided to dumpster dive. You're doctor now, Alicia! A doctor! She made some good finds. A lady bug and a outdoor BBQ grill. To earn some logic points she wanted for work, I sent her to the park, where she met Chester Swain. I don't know why he's thinking of a pond. There isn't any in the park. He seemed very interested in the fact that she just moved in. Alicia: "Why is this guy so obsessed with where I live? Oh, he's a cop." Alicia: "Yes, Mr. Cop, I mean Mr. Swain. I just moved here, I'm a good law abiding newcomer." Chester: "Do you have a criminal record?" Took your time answering. Something to hide, Alicia? Bailey being stalker in the background. 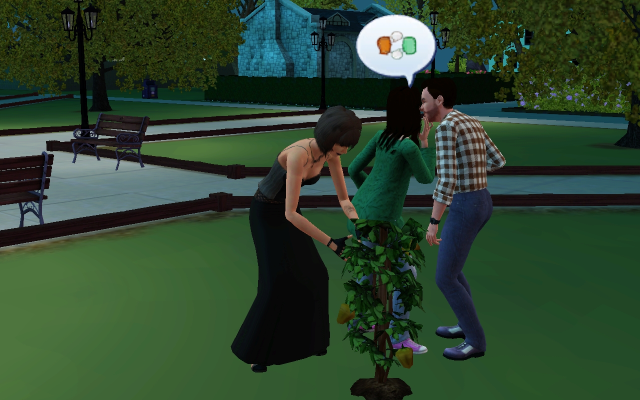 Then she decided to eat out that bush. Wouldn't be the first time in this update. Chester seemed extremely interested, and watched her the whole time. For work or stalking? 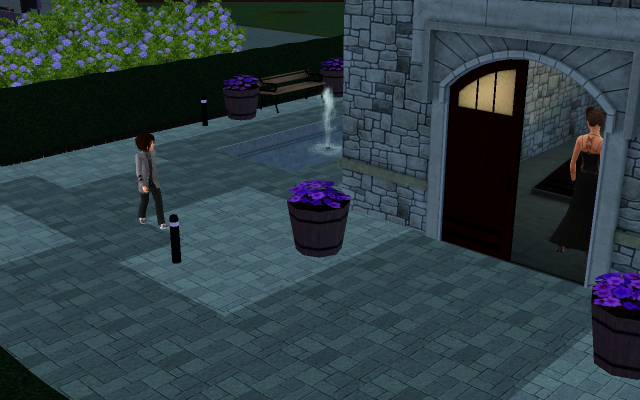 Bailey: "Can you believe that tramp eating from that bush?" Shut up Bailey, I can’t slap Bella, but I can slap you! Selling the few veggies she didn't eat and the grill from earlier, she could afford a decent basic kitchen, and two lights! No more stumbling in the dark for Alicia anymore. Alicia: You want to pay me to gain one skill in mixology? Of course! Right away! She lied. Alicia doesn't seem to get skill wishes any more. 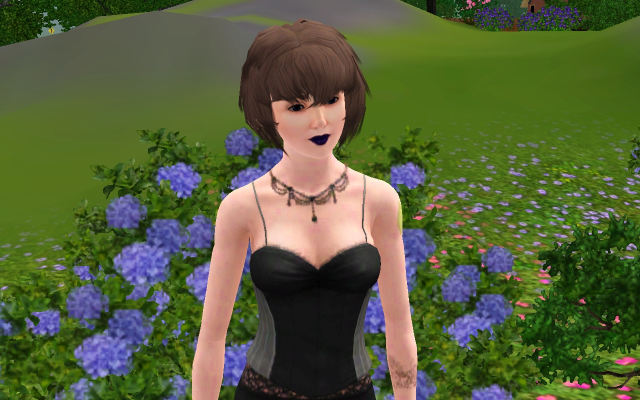 Going back to the park to eat from more bushes socialise, she got to fulfil her wish to meet a supernatural! He was a a-hole, and dismissed her for not being a celebrity. Good riddance. At least Alicia doesn't look like someone threw her clothes at her. Skilling time! That fairy walked by. Alicia: Look busy. Pawn goes to where?! How should I know how to play this game?! 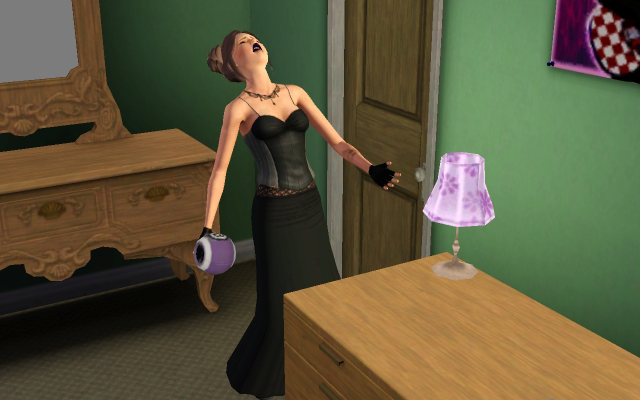 For some reason, she had to wash her hands 3 times. Good, she is practising some doctor skills. I'm guessing another dumpster dive will be in her future. 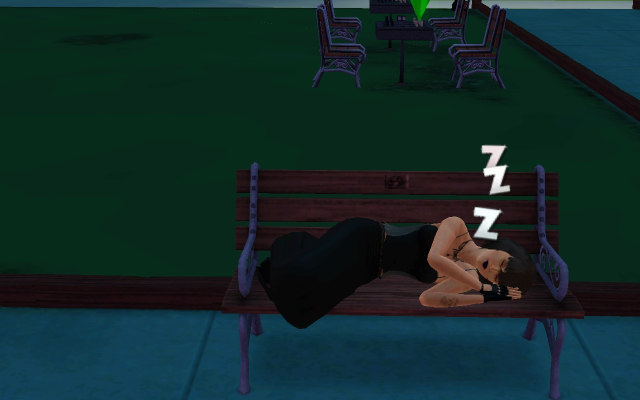 Then she slept on a bench. Her house is beautiful. She should sleep in it. In case you're wondering why her hair is different, I sent her to the mirror in the rest room to give her a hairdo more befitting for a doctor. Maybe that will encourage her to skill and stop eating from bushes. Moment of stalking of Chester, but he wasn't home yet. Alicia: Hi Bailey! No, of course you're not a complete Mary-Sue who has the whole world revolving around you. Sparkling vampires aren't stupid! I'm sure everyone falls in love with them...."
Bailey: "What are you doing on my lawn?" Chester came home! Alicia set her sights on him. The fact that he has a fully furnished house might have encouraged that. Bailey: "I'm tired of seeing this tramp pawing at my dad." Well go to bed! If there is any vampires in there, I'm coming in with a blow torch. Alicia hit on Chester a while, but then he kicked her out so he could sleep. I sent her to the store to buy some skill books, maybe that will encourage her to gain some skills or take her job seriously! Alicia actually slept in her own bed! She also read a skill book and earned that point and got paid for it. Bailey: "What are you doing on our lawn again?" Alicia: "I came to see you, Bailey." And she ate from every single one of those plants near the house. 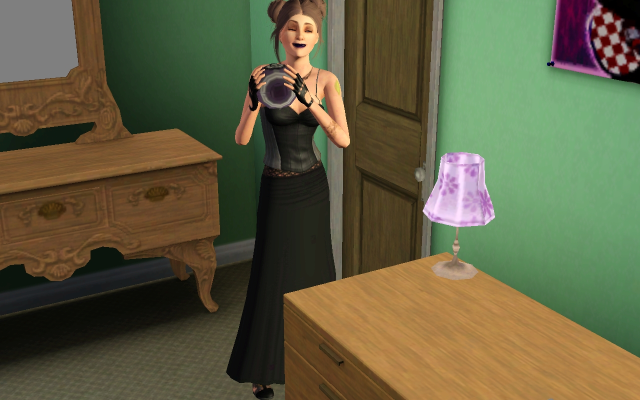 Alicia: "Oh wonderful Orb of Answers, please tell me that the Twilight Saga is over." Alicia: "Really? Twilight is over?!" Alicia: "WHAT DO YOU MEAN SHE'S WRITTEN TWO MORE BOOKS AND A GENDER SWAP TWILIGHT SINCE THEN?!" No really, she asked the first time if she was going to be rich, and the second was about true love. 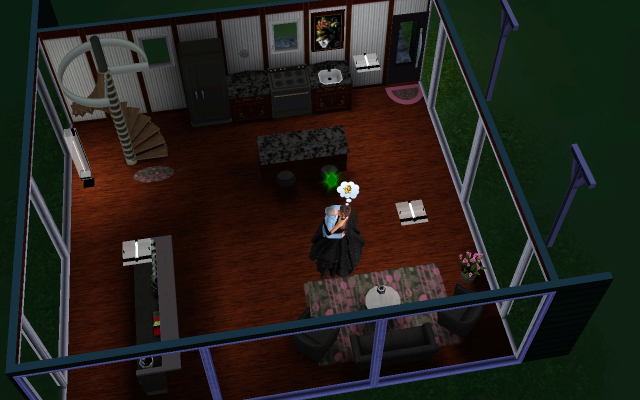 She now wishes to be worth 15,000 simoleons, since she has like no work ethic, that doesn't seem likely. And she wishes to have three romances at once. Alicia: "Hey Chester, so you're single, I'm single, how about I spend the night?" Last edited by Nevermore on October 1st, 2017, 8:24 am, edited 1 time in total. Hoooo there, looks like Alicia is off to a good start! Yes, I would love to see you smack Bella anyways. She's a child who cannot make grownup decisions. Her boyfriend dumped her, so her life is over. You know, typical teenage jazz. Alicia is gorgeous though, and the new hairstyle suits her! Her stalking Chester was pretty funny too. How could he possibly say no to her charms? I'm excited to see all the different live Alicia could live! Bailey will indeed get a slap for Bella. If Alicia and Chester get married, Alicia is her new mother. Bailey really hates Alicia for some reason. 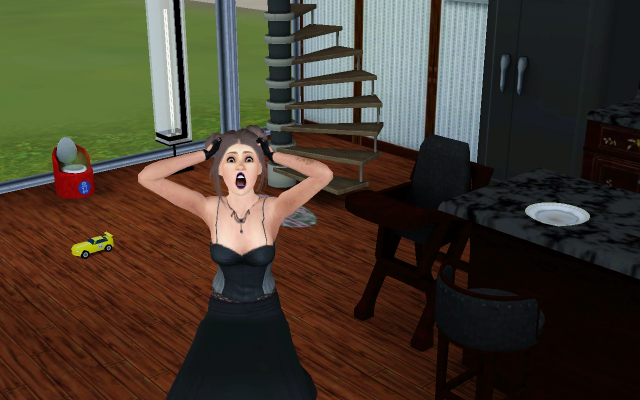 A lot of socialising that I couldn't snap, is Bailey yelling at her or insulting her. The stalking cracked me up. She constantly rolled wishes to talk to him. 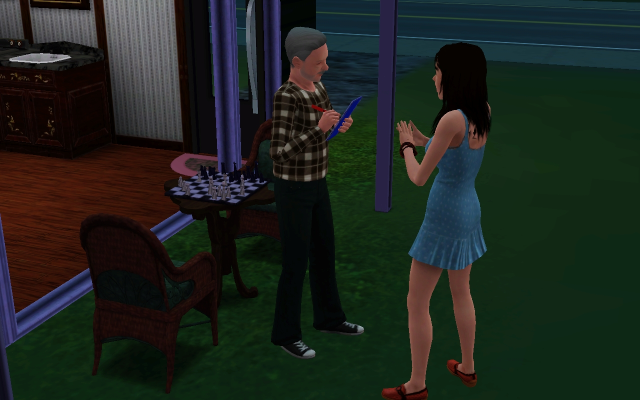 I was yelling at her to skill up or earn money, but Alicia was adamant she would stalk him. I love playing her. I never know what she's going to do. I send her to a lot, have the camera set on tracking her, and get so many snaps. Bailey: "Why is she here?" Alicia: "Because me and your dad are going to spend the night together." Alicia: "Now eat the hotdogs I cooked for you." Bailey: "Did you spit in it?" 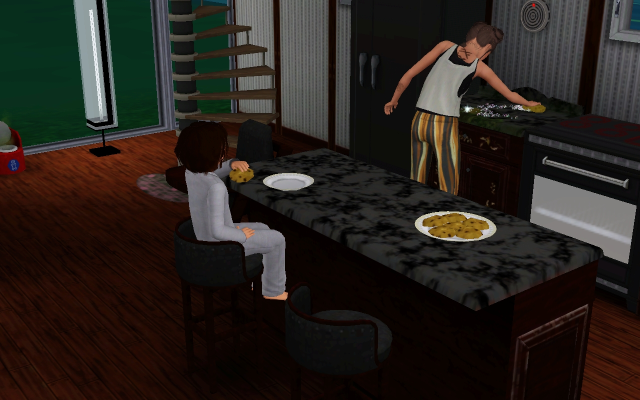 After Chester agreeing for her to spend the night, Alicia made them all dinner. Used the facilities that her house was lacking. Watched the TV. Hogged the bathroom. Hit on Chester. The usual stuff. It was a stalker's paradise. For some reason, her wish for three romances had disappeared, even though I had it locked in. 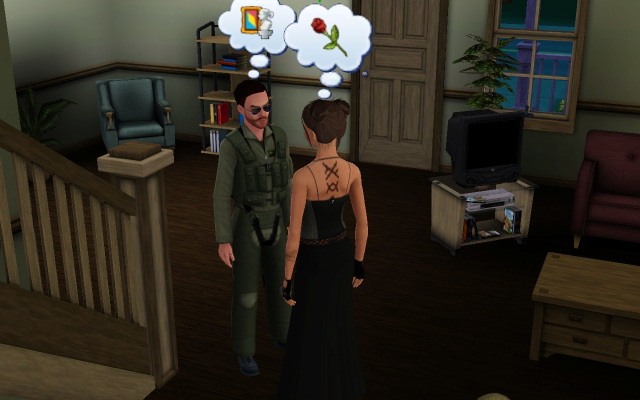 Chester spent a lot of the night thinking about Alicia, and she had romance on her mind as well. He's smitten with her! How could he not be? The next day was a saturday, and she had the day off work. I sent her to La Shove to find something better to do. She was obsessed with this crane machine. She won a vampire scary bear, a dino toy, an imaginary friend scary bear, and an oval cut blood ruby. She sold all of them except for the imaginary friend bear. Heading to the beach had a good effect on her, because she decided to learn another skill point in Mixology! Beautiful sunset on La Shove. As it turned out, Chester was swimming at the beach. Who's stalking who now? 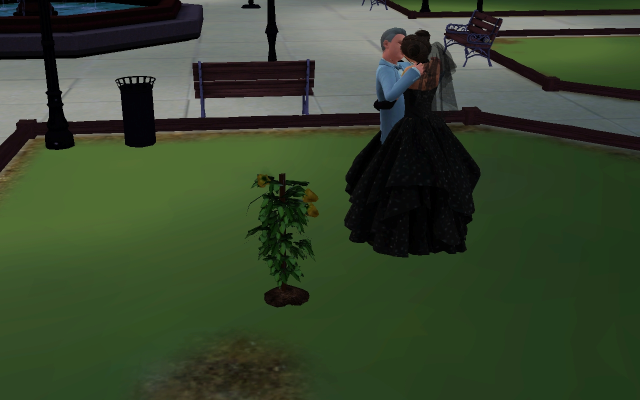 They went on a romantic date at the restaurant right across town, and had a good old smooch outside. 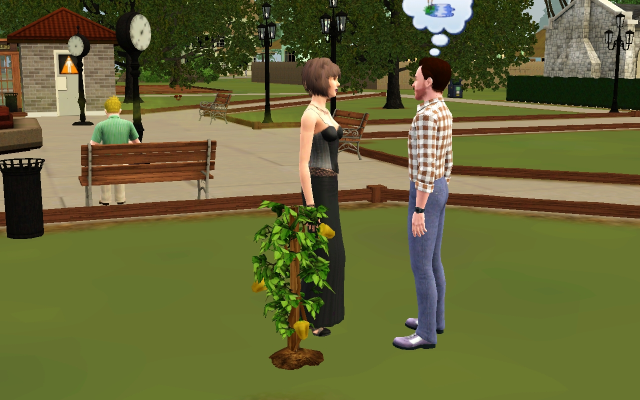 Despite his unflirty trait, he is really digging on her right now. Alicia: Chester, do you want to spend the night? And, this wouldn't be the first time she wished for that either. 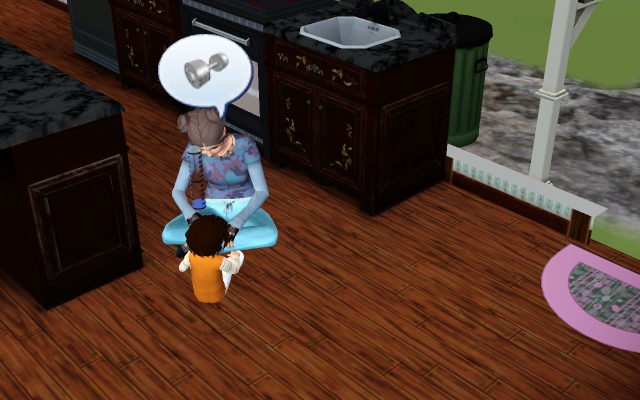 She keeps rolling loads of wishes to woohoo with him. Chester is a good influence! She started getting wishes to gain logic points for her career. Maybe she will actually get a promotion soon. 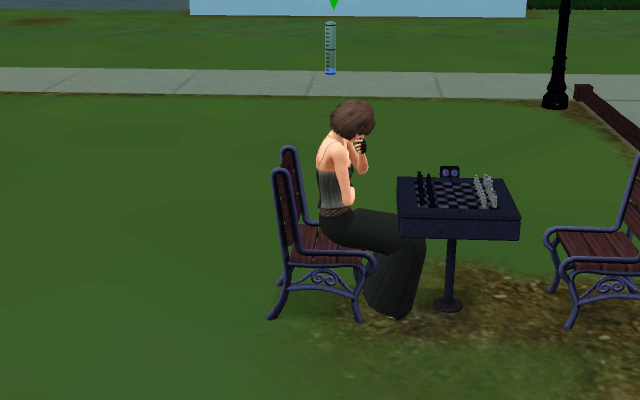 During her little chess game, she rolled a wish to go to the art gallery. Now I know why. Yep, Bailey is all grown up now. That is her casual outfit. Um, no taste? Their date ended up back here. I don't like this pic. I know I crack parody jokes, but too far Chester. Too far. 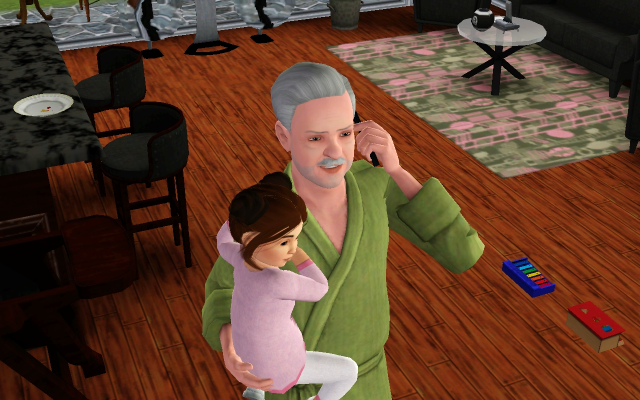 Alicia called him the next day after work, and Chester had gotten old. She didn't seem to mind. I did. I was like Who is this old man at the door?! Alicia: "We're meant to be, Chester, marry me?" Chester: "Oh, this is so sudden?!" Really, Chester? You've both been giving me major hints you should be together since practically the moment you met. They were married some place very special. Chester: "With this ring, I promise to stalk only you." Alicia: "You're the only man I ever wanted to stalk." I now pronounce you Mr and Mrs Snowe! May you live stalkerly ever after, and eat from many bushes. 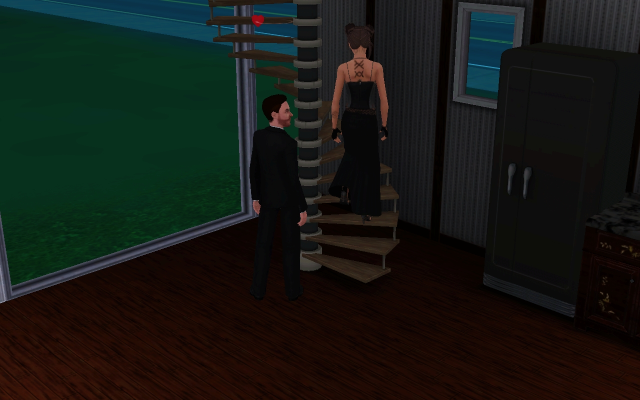 Alicia and Chester headed home to begin their wedded bliss, and with the money Chester brought in and the gifts, and selling some things from his inventory, it came to around 6500 simoleons. Enough to make her empty home a lot more homey! Upstairs got a few homey touches as well, but we'll see some of them later. They actually blended quite nicely into married life. 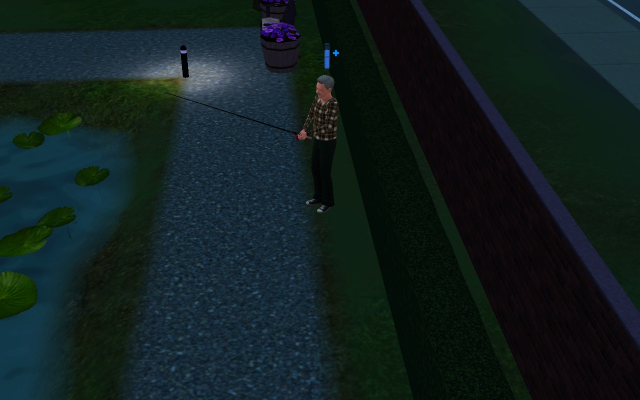 Chester kept rolling wishes to go fishing, which brought in more money for the household selling them! 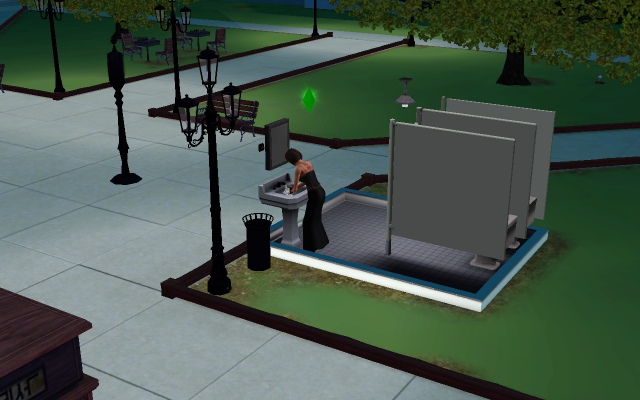 Plus his fantastic pay check, like 1000+ simoleons a day! His first paid day off pay check gave them some more luxuries in their bedroom. And Alicia wanted to improve her cooking and learn recipes! What happened to her? She went from sleeping on benches, stalking and living a hobo life to happy hardworking wife? Alicia: "Oh great Orb of Answers, my guide in life, my husband keeps wishing for having a baby with me. Should I have kids?" Alicia: "Oh my god! I'm married!" 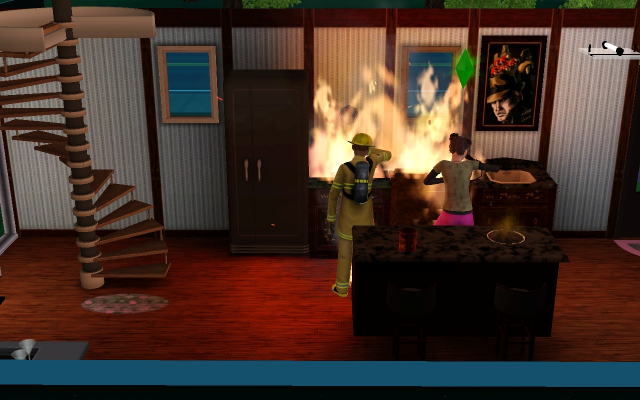 I love when sims do this. Chester did a lot of cooking, but Alicia chose quick meals. Well, that's a step up from foraging for food. They had many intense and passionate... chess games. Seriously. 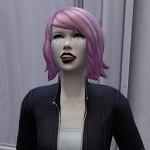 She no longer rolled wishes to woohoo with him every fives seconds. 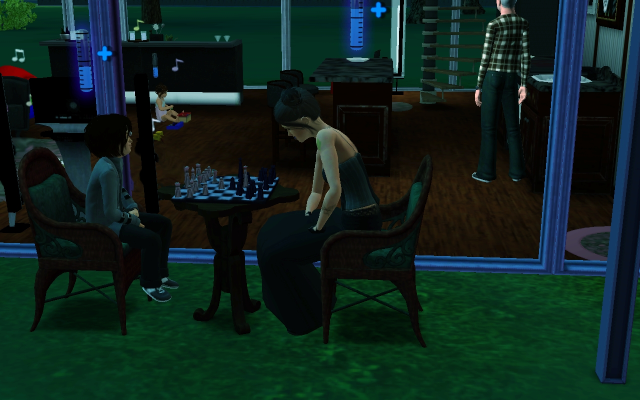 He kept playing chess, and she always joined him. Good, Alicia, you're finally working towards your career! She has gotten a promotion since the wedding! I tried to snap it, but I was too late. Still not free of her... Bailey kept visiting her father. Bailey: "I'm so happy I don't have you turning up at my house any more." Alicia: "I will hit you." This cracked me up, and I had to snap it. Chester: "So this boyfriend of yours, does he sparkle?" Chester: "Run around naked, claiming to be a werewolf?" Chester: "Has he slept over in the house?" Bailey: "Ur, Dad, you used to sleep with some tramp in there practically every night." Chester: "You will show your step-mother some respect!" Chester is actually a great husband. He kept rolling wishes to gain gardening skill points or plant things. He can provide fruits for Alicia's mixology! 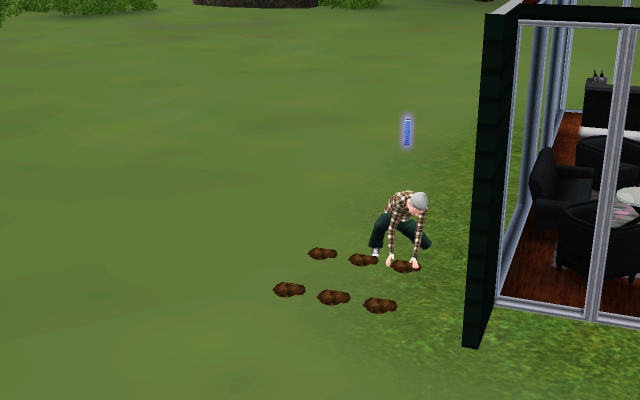 That garden had to be moved afterwards, I forgot about a certain zombie annoyance. 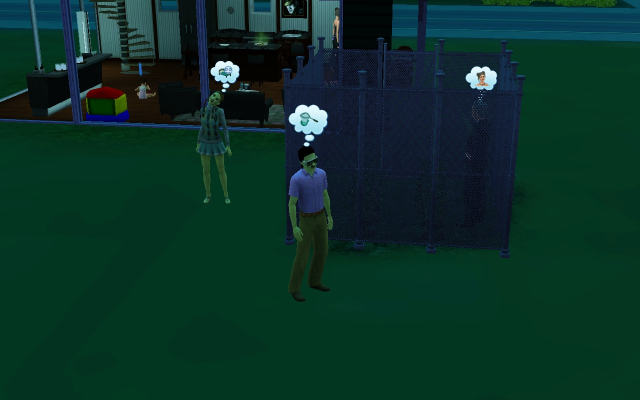 So I built a fence around it a bit away from the actual house. This save has actually been lacking on zombies. Last full moon was when Alicia and Chester met at La Shove, and there wasn't that many zombies then. He's also getting senile, because he kept leaving food cooking on the stove before dashing off to work. Now, why is Alicia dressed so colourful? Welcome to the family Jareth Snowe! His traits are Virtuoso and Brave. Alicia: When you push a baby out your body, you can name him what you like! She had a baby?! Whoa, that was quick! I loved, loved the references to Twilight. I can't believe she had a baby already! Thank you for using my little ol' house. I hope Alicia doesn't give you too much trouble. 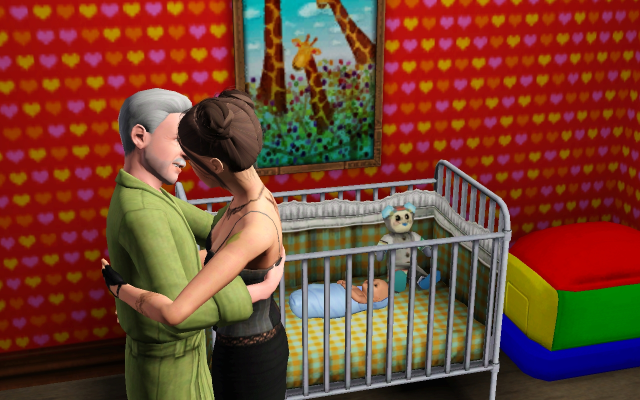 Happy to see the stalker couple come together in matrimony and babyhood! Bailey can eat dirt! Cororon wrote: She had a baby?! Whoa, that was quick! I know I already thanked you in chat, but thanks again for commenting Cor! Mpart wrote: I loved, loved the references to Twilight. 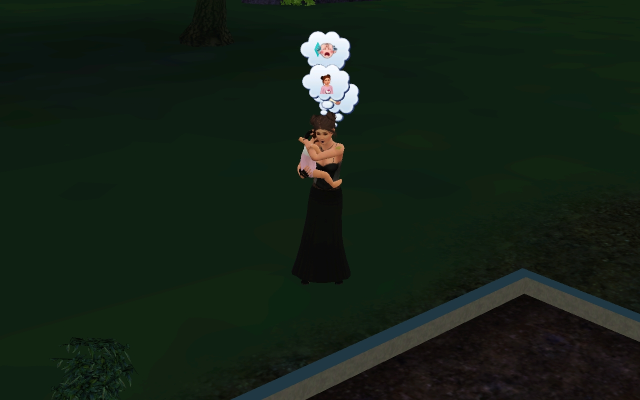 I can't believe she had a baby already! Thank you for using my little ol' house. I hope Alicia doesn't give you too much trouble. I couldn't help myself! They felt so natural. I couldn't believe it either. 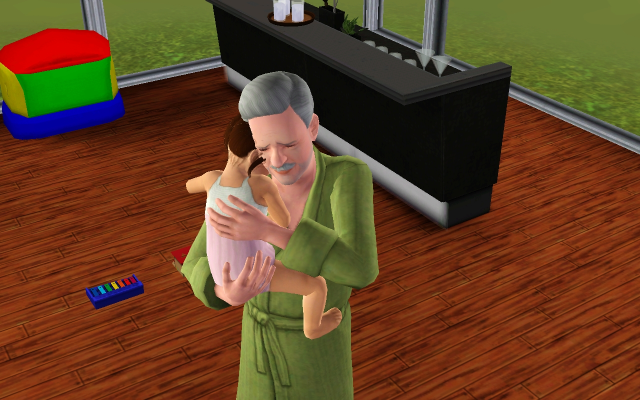 They had barely exchanged rings, and Chester wanted a baby. Then Alicia was all over the Orb of Answers asking to have kids. So, why not! Then again, Chester was 81 days when he moved in. Alicia is fun to play though. She's so unpredictable! Just when I figure out where her life Is going, she throws a surprise at me. I do love the house! Do you like what I've done with it? 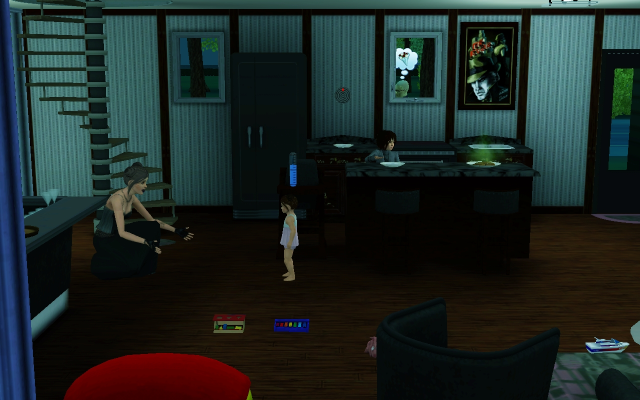 Once I'm done with Alicia and Chester's room, and decorated the hall, I'll share some pics of that! I still plan to add a stereo to downstairs. Sadly, we're not rid of Bailey yet. She can still eat dirt! 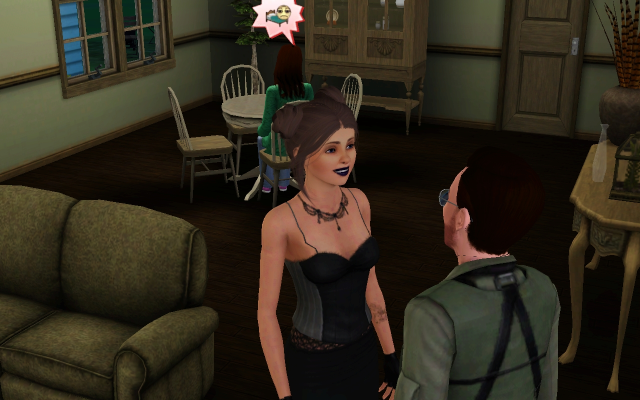 During a full moon, Alicia want to socialise with a werewolf. I managed to track her boss down to a fishing spot not that far from their house. I can't remember his name, but I'm pretty sure he is a pre-made werewolf. He has been a werewolf the whole time she has worked at the hospital. Alicia: "Can I have a promotion?" Wolf-Man: "You never show up, and I forgot you even worked at the hospital." Alicia: "So, you're a wolf..."
Wolf-Man: "Before the sun went down, it was nice." Alicia loves her cuddles with Jareth. 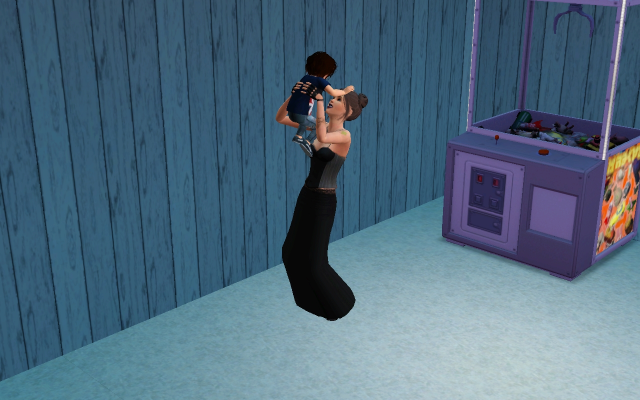 Motherhood seems to have really calmed her down. Alicia: "What kind of magic spell to use? Slime or snails, or puppy dog tails? Then baby said..."
But not that much! She got a wish to get a new tattoo. It's hard to see properly in this size pic, it's a pentacle on her left ankle. 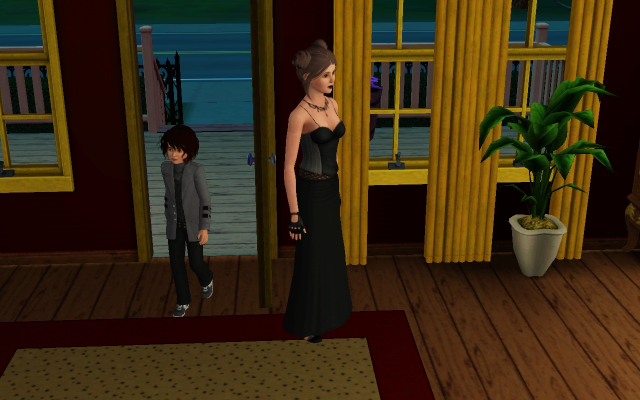 Also, that's her new formal outfit. No need for ballgowns now that she's a married woman. Chester approves! This is the first of many wishes for them to either kiss or woohoo from both of them. And again. It's about here Chester rolled a wish to have a baby, and Alicia still had a wish to have a daughter from her pregnancy with Jareth. So, they're going to have another! More mama and baby time! No reason for this pic, it's just adorable seeing her so loving to her son. 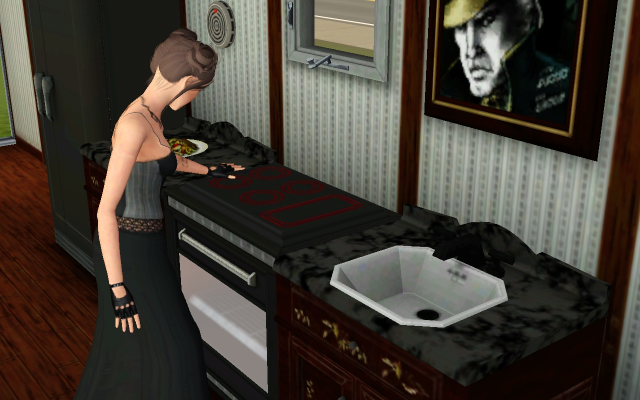 Alicia wanted to learn a new recipe. I chose cookies, because the little ones will probably love that when they're a little older. Also, Chester in the background in his garden with the anti-zombie fence. Good luck to them trying to get through that! 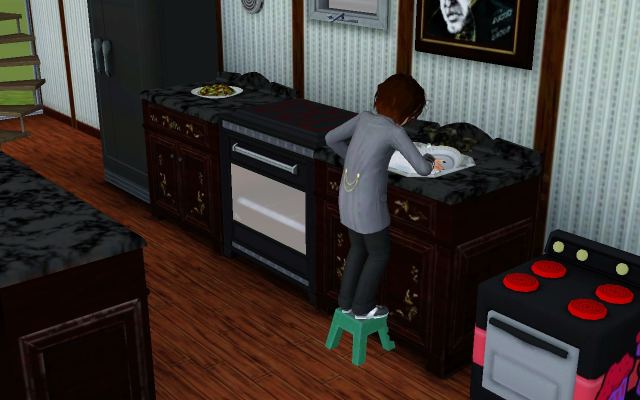 Jareth as a toddler! He has Chester's natural hair colour. I've never had that happen before. Babies born to at least one elder parent either have gray hair, their other parent's or blonde. 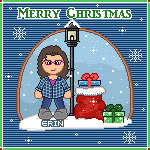 Also, yay! His outfit is perfect for a tiny little rock star. Wishes started rolling for Alicia to teach Jareth his skills. She really does love him. He is closer to Alicia than to Chester. I really don't like how maternity wear looks on Alicia. Since they both had wishes to teach him, Chester took over while Alicia was busy with something else. Also, Jareth looks so cute in his fox PJs! This kid is just too cute. She was in hospital giving birth to Sarah! Okay, hands up. Who was surprised that she was named Sarah? So he didn't feel left out, Alicia took her little Goblin Prince to La Shove beach. His first goblin toy was a freezer bunny. Alicia tried to win another one, but didn't get it. She did get a gem stone to sell. Alicia: "Come here my little Goblin Prince! I love you so much! 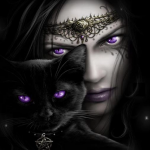 You can have any realm you want." They are quite harmonious as a family. The days are ticking by. Chester is a few days away from 90. Grim Reaper could rip apart this little family any day now. Toddler Sarah! Adorable in her little Hello Kitty tunic. Again, she got Chester's natural hair. Darker brown seems more dominant than Alicia's. Alicia: "Aren't you so cute!" 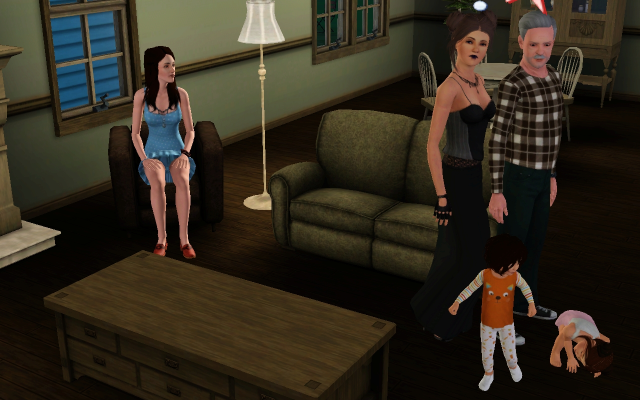 Chester wanted to talk to Bailey, and everyone was going a little stir-crazy, so they made a family outing out of it. 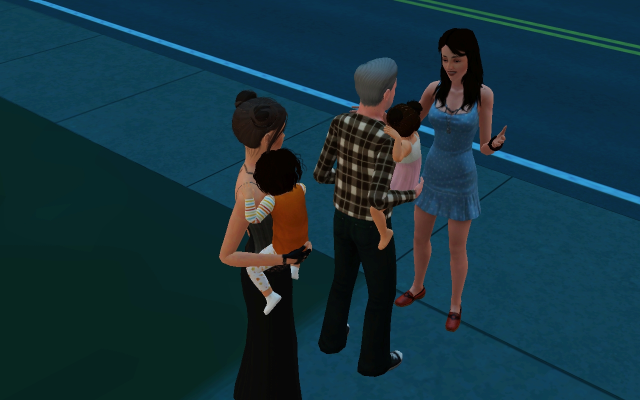 Bailey: "Alicia, and the kids... "
Bailey was actually quite rude. The kids couldn't do anything. 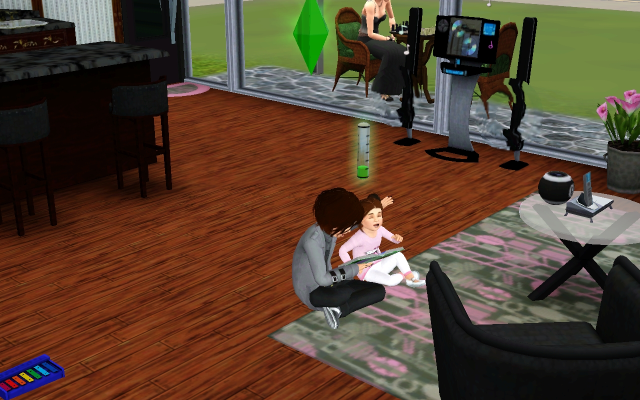 Even when I gave them bottles to drink, there was a popup saying that Jareth and Sarah were acting inappropriate. She has offended Mama Bear Alicia. Alicia: "I so want to slap this Bella-Sue." 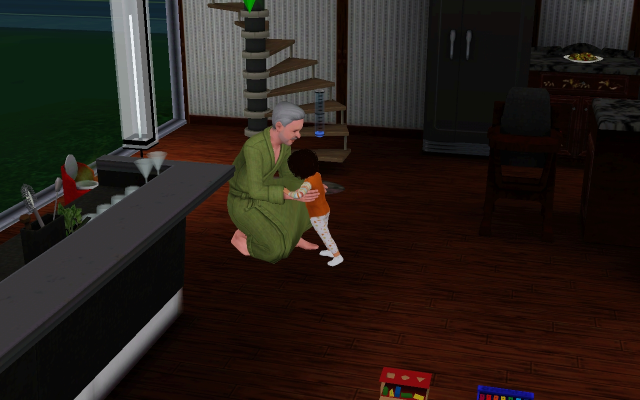 For no reason, Bailey grabbed hold of Sarah while she was crying, carried her out the house and dumped her on the ground. Alicia was quick to comfort her crying little princess. Alicia wanted to be mean to Bailey, and I was more than happy to oblige the next day. Alicia: "How dare you throw my baby out in the mud last night, you sparklepire obsessed Mary-Sue! You come near my babies again, I'll slap you out of this world. And I don't care what your dad says!" Bailey's messed with the wrong Mama Bear. Alicia actually got a one star celebrity status for this. Bailey has two stars. They are now enemies, with a full negative bar. Chester took care of little Sarah, fulfilling a wish for both of them. Chester: "You're such a big girl now." Alicia went into a total rage clean. She practically scrubbed the whole house. Usually they are such slobs. I'm glad she finally told Bailey off. I'd say Bailey got off easy. LOL The tots are so cute! I adore the kids. They're such little sweethearts! The top is a tube top from the Late Night pack. 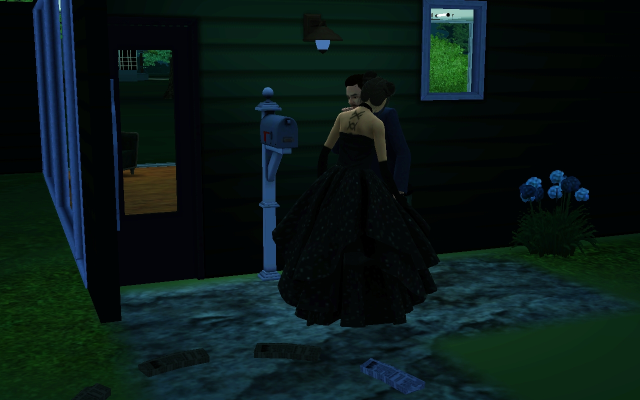 The skirt is called Unicorn Skirt, and you can get that from Sims Resource. I'm not sure if I can post a link to it, but if you alter the category to weddings, I've seen it in there. You can pair the skirt with any top you want. Both items were made black with patterns in Create a Style. The sparkle part, is actually a pattern that comes up a lot in the Crumplebottom sisters house, in Moonlight Falls. Instead of blue, I made it black. I had it saved. It looks great in game too, as you can see! Anyways, we have little Sarah to join our little Jareth! I'm totally surprised by this turn of naming events. I loved the confrontation with Bailey and the rage cleaning. Gods know I always end up rage cleaning sometimes too. Jareth looks like such an adorable toddler! I can't wait to see him grown - Sarah too! So far this first life in this sliding door challenge seems to be working pretty well! I don't know how I'm going to handle Chester's death either. All future spouses won't measure up to him. Jareth looks adorable as a child. I think I see a little of Chester in him. I always knew her daughter would be called Sarah. 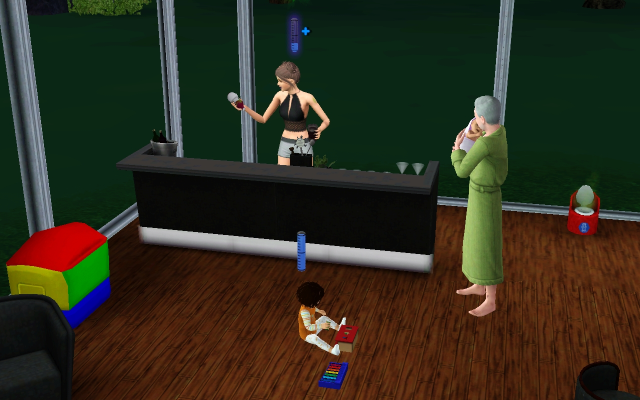 I'm glad she got the wish to be mean to Bailey, after what she did to such a cute little baby. The rage cleaning made me laugh so hard. I couldn't not snap it. Chester: "You can't get me!" Alicia: "CHESTER, STOP TAUNTING THE ZOMBIES AND GET IN THE HOUSE!" Chester: "Yes, my beloved stalker." Chester was gardening, when the zombies came out. Good to know that the fence is doing its job! Alicia: "Come here, my little princess. Come to Mama." Is that a child Jareth at the counter? Yep! He grew up about a game hour before Chester decided to play You Can't Eat Me with the zombies. Jareth now has the Genius trait. Alicia wanted him to become a genius, which dovetailed nicely with the trait I intended for him. 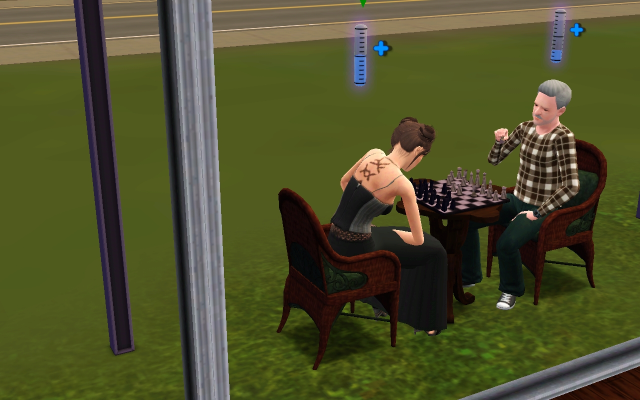 Jareth and Alicia started playing chess together. Jareth: "Your bishop falls into the bog of eternal stench!" Jareth's first day of school. One kid not needing constant parent supervision, one more to go! Alicia: "And your daddy's life was just like this man in a book, and Mama kept going to all the places he went, and visited his house all the time. Then Mama and Daddy got married and lived happily ever after." Time for a little family outing! Jareth wanted to go to the Vault of Antiquity, and Alicia wanted to buy an elixir. The store didn't have it. 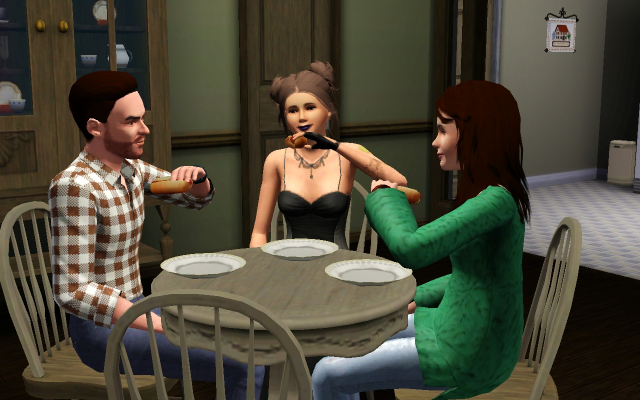 They were both hungry, so I sent them to the diner to get something to eat. Both of them headed in to study supernaturals. 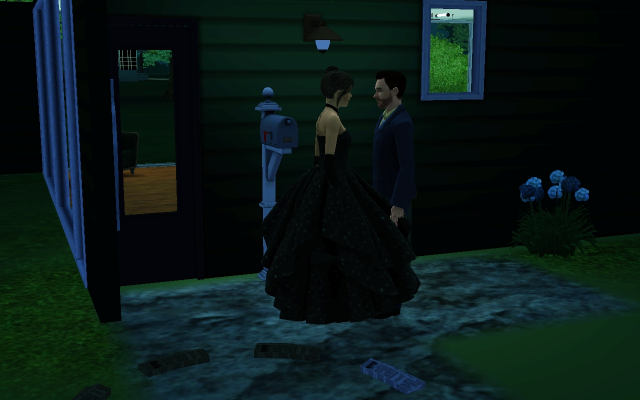 Jareth: "One day, I will possess all the magic of Moonlight Falls..."
Alicia came out tired, and a loony moodlet. Jareth didn't have any negative effects. 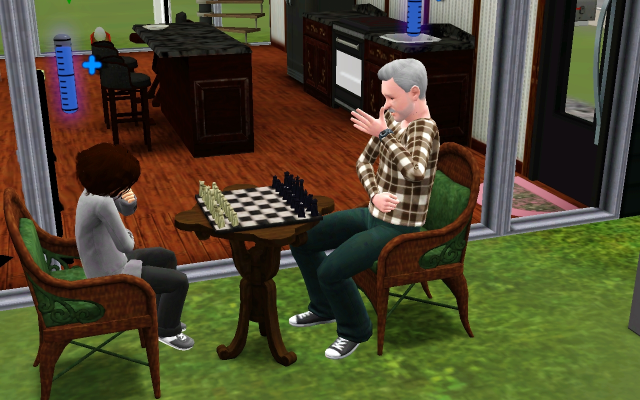 Father and son bonding time over chess. Chester: "Did you make any friends?" Jareth: "No. Girls are crazy. Is girls following you around all day normal?" Chester: "More normal than you know." Chester: "You talked about girls to distract me!" Alicia's never seen working out clothes! 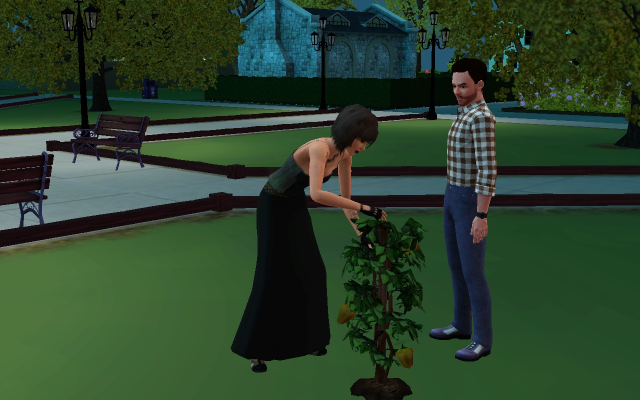 Chester: "I've loved you since I first saw you eating out that bush." Alicia: "I've loved you since I first saw you half naked on La Shove beach." Both of them enjoying what time they have left together. I really do love them as a couple. Wow, tearing Bailey a new one has had a good effect on Alicia! She's cleaning again. Jareth supervises while polishing off a cookie or two. Jareth: "You missed a spot, Mum." Alicia: "Yes, my Goblin Prince, I see that now. You enjoy your cookies, don't get up." Alicia: "Sleep well, my precious sweet Goblin Prince." I love seeing these little mama and son cuddles! She really is a good Mama Bear. Alicia: "The kids are in bed... maybe I can have a drink, or two, or three..."
Chester: "I love you to the moon and back, and when I'm gone look up to the stars and I'll be looking down at you." Chester: "Work, I'm retiring, so I can spend my last days with my kids." Chester finally decided to retire. We'll miss his large pay check, but at least Alicia will actually get a promotion some day soon. Alicia: "Woo! I get to go to work now! I might get promoted!" Sarah: *thinking* "I'm playing with blocks. I wanted cuddle." Jareth: "Once upon a time, there was a beautiful young girl whose step-mother always made her stay home with the baby. The baby was a spoiled child, who wanted everything for himself and the young girl was practically a slave. What no one knew, is the king of the goblins had fallen in love with the girl and given her a special power." I had to snap this! 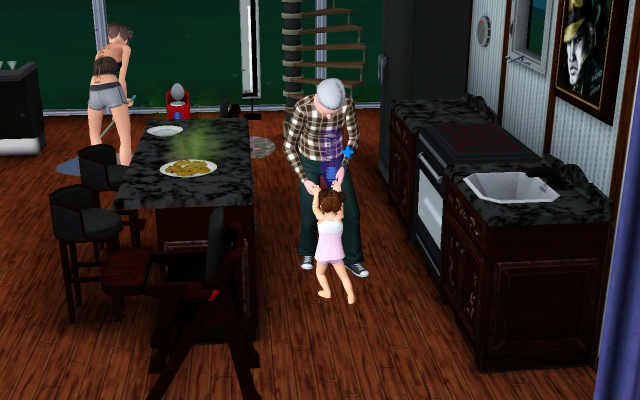 The Snowe kids are just so adorable! I can't get enough snaps of them. I knew I always liked Jareth! He cleans his plate after eating! Maybe the Snowes won't be such slobs anymore! 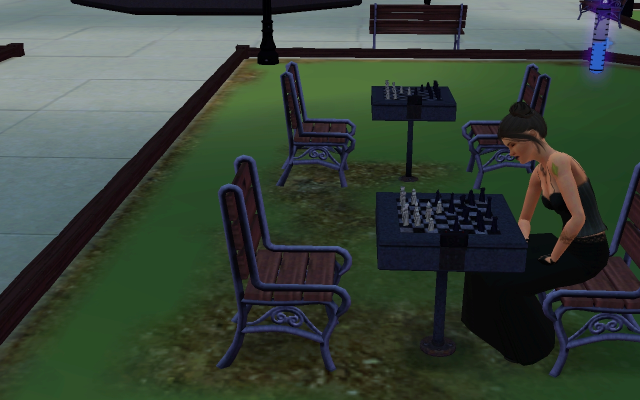 Alicia's first ranked chess match turned out to be against Chester. She had plenty of practise against him, so she easily won. Alicia: "Stove... please don't burn down my house again!" Her neurotic trait is showing! Alicia: "I love this song!" 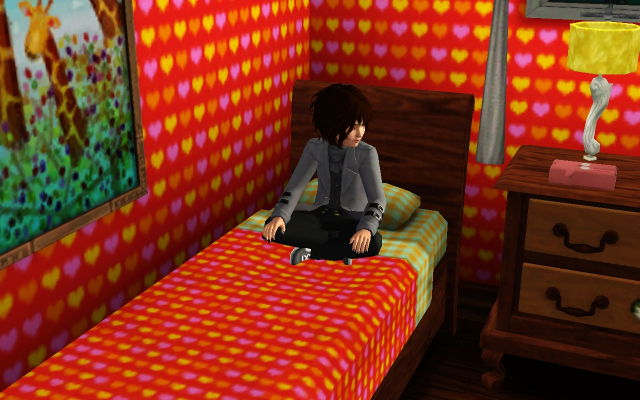 Jareth enjoying the peacefulness of his bedroom. He has to share with Sarah, but she is a surprisingly quiet baby. She hasn't woken him up once with crying. Alicia: "Ew... gross... no more diapers, means stinky potties..."
Sarah: "I make more, Mama." Alicia: "WHEN CHESTER DIES, I'M GOING TO BE ALONE RAISING TWO KIDS... NOT ENOUGH MONEY TO PAY THE BILLS!!" Only just realised that now, Alicia? 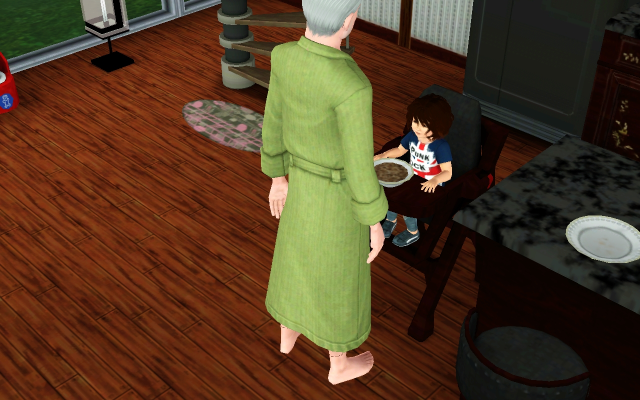 The kids are cute And yeah, Chester is old... and you play on Normal? Not Epic? I play on normal. 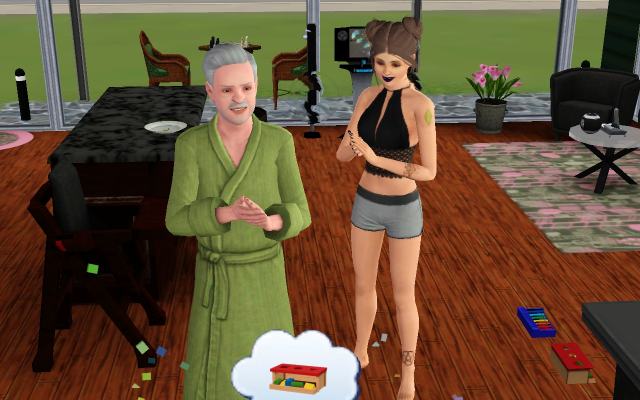 I thought he was 81 when he moved in, but I was wrong. He is over 90 now.